For sale is one (1) Juliette Gordon Low Founder Scout Travel Trunk. Have you ever wondered how best to teach your scouts about Juliette Gordon Low? She is a fascinating person and the perfect role model for scouts. She lived a life full of adventure, service to others, and leadership. Juliette's Travel Trunk was created to make it easier for leaders to teach and more fun for scouts to learn about Juliette Gordon Low. The trunk and the items inside are tangible symbols of Juliette's personal attributes and life experiences. 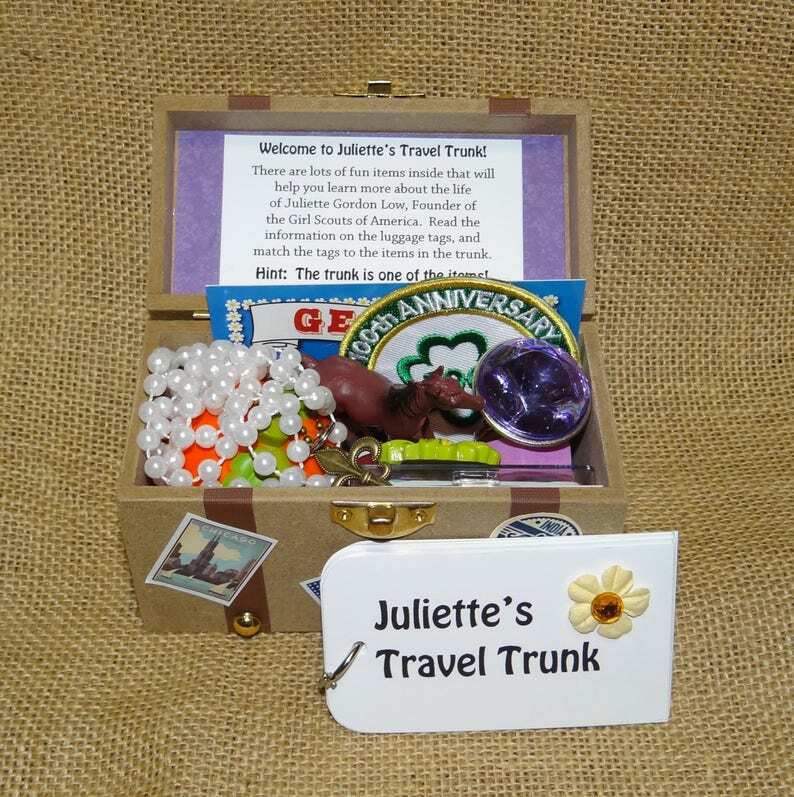 Each girl will get to decorate her trunk with travel stickers, pack Juliette's items into the trunk, and learn about Juliette by matching the luggage tags (biographical information) with the items (artifacts) inside the trunk. This gift is educational, entertaining, and enduring for younger girls, older girls, leaders, and troops! Surprise each of your girls with a trunk on Founder's Day (October 31), at a bridging or awards ceremony, or for the holidays! Juliette's Travel Trunk is also a great gift for the scout(s) in your family. Surprise your daughter, niece, granddaughter, or daughter's troop leader with a trunk. In years to come, the handbook may not last, but Juliette's Travel Trunk will, and it may even be passed down to the next generation scout in your family! Every Travel Trunk includes: 1 wood trunk, 9 travel stickers, 11 items, and 11 luggage tags. The outside of the trunk is already decorated with gold studs, a gold hinge, and brown straps. The inside of the trunk is lined on the bottom and on the inside of the lid., and a welcome message is taped to the inside of the lid. The trunk will teach your girls about: Juliette's birth and death, her hobbies, her marriage, her travels, her nickname, and her role as founder. You will fall in love with this very special Girl Scout® gift - the perfect reward for selling all those cookies! YOU ONLY PAY SHIPPING FOR THE FIRST TRUNK YOU PURCHASE. SHIPPING IS FREE FOR ALL ADDITIONAL TRUNKS YOU ADD TO THE SAME ORDER! All remaining items fit inside the trunk.